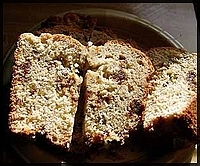 Easy baking recipes for bread, cakes, biscuits, muffins, scones etc. Make these great recipes in no time at all. You don't need a baking school or a baking degree to make these! These recipes are totally fool-proof! You will find quick baking recipes here for no-nonsense home baking. They are my favorite recipes that I have collected over the years. In my early years of baking I was terrible. 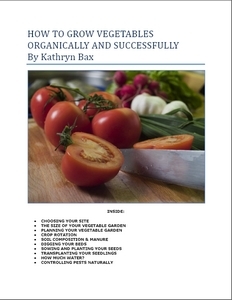 However, with these tried and tested recipes you will find that they are foolproof and come out great, every time. We hope you enjoy making these easy baking recipes and send in one of your best recipes below. Pre-heat oven to 240°C. Mix all ingredients together in a mixing bowl. Drop spoonfuls of mixture onto a well-greased baking tray. Place in hot oven immediately. Turn oven off and leave to bake for 10 minutes. Remove from oven and cool on a wire rack. Serve warm. Now isn't that a great baking recipe?! Delicious! 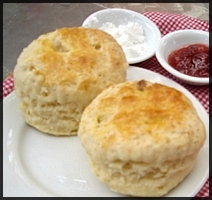 Fancy making some great scones? 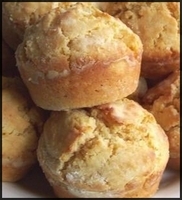 You will be surprised what a difference a can of lemonade can make to your scone recipe! Yes, this scone recipe uses lemonade, and the results are amazing! Mix all ingredients in a bowl to a smooth dough. Tip out onto a well-floured board, press down until dough is about 1 inch thick. Cut into squares or rounds with a cookie cutter. Bake at 220°C for about 15 - 20 minutes until they start to golden. Check with a skewer to see if they are cooked and cool on a wire tray. 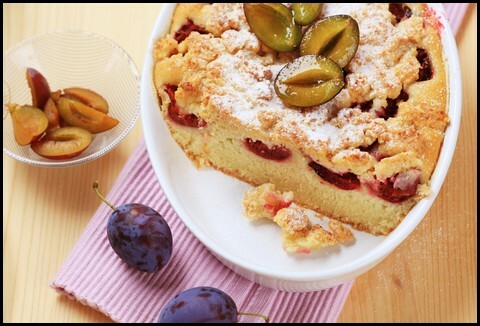 Serve with strawberry cream and whipped cream. Put dry ingredients into a bowl. Make a well and stir in milk to make a soft dough. Place on a floured board and cut into shapes. Sprinkle extra cheese on the top and cook in hot oven - 220°C for 10 minutes until brown on the top. The best cookie recipe! - and they taste great! Beat butter, condensed milk and sugar together until light and creamy. 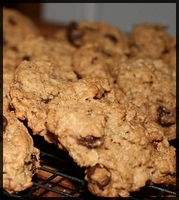 Add flour, rolled oats, baking powder and chocolate pieces. Put tablespoonfuls of mixture onto a greased oven tray, and flatten with a fork. Cook at 170°C for 20 minutes until golden. Place butter and golden syrup in a small saucepan. Stir over low heat until the butter melts. Remove from heat and stir in condensed milk. Place the dry ingredients in a bowl and pour in the butter mixture. Stir until thoroughly mixed. Place teaspoonfuls of the mixture onto a lightly greased baking tray. Push down with the back of a fork to flatten. 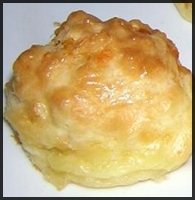 Bake in a preheated oven for approximately 15 minutes, or until biscuits are golden brown. This is a great way to use up those squishy bananas in your fruit bowl and makes baking a pleasure with this easy and delicious loaf. For this recipe baking can't get any better! In a food processor mix the butter and sugar together until light and fluffy. Add the beaten eggs, mashed bananas and walnuts and mix thoroughly. Lightly mix in the flour, baking powder and baking soda. Pour mixture into a well-greased, large loaf tin. Bake at 180°C for 45 - 50 minutes. Cool in tin before removing and place on a wire rack. Slice and butter. Put dates, nuts, bicarbonate of soda, butter, sugar and hot water in a large saucepan. Simmer gently for 5 minutes and allow to cool. Add the flour and the beaten egg. Put mixture into two greased nut loaf tins (cicular tins with a lid at one end). You can use ordinary loaf tins if you don't have these. Bake at 180°C for about 40 minutes. 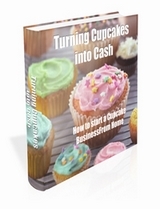 I like collecting muffin recipes as there are so many varieties that you can come up with. Baking muffins always give you the ability to ring the changes. With this basic muffin recipe you can add a little more cheese and take out the leeks, or you can take out the leeks and substitute it with bacon or onions etc. Mix the flour, cheese, leeks and salt together. Beat the egg and add it to the milk. Mix lightly together. Don't over mix, otherwise your muffins will be tough. Bake at 180°C for about 20 minutes, or until golden. Your baking is done! Despite the name, they don't require any baking. Instead they are made on top of the stove. Mix all ingredients together in a food processor. Over a medium heat, drop spoonfuls of batter into a well-buttered, thick-based frying pan. When bubbles appear on the surface of your batter and burst, turn over and baking until golden. Place on a plate as you finish each batch. Serve with butter, or butter and honey. Preheat oven to 200°C. Mix dry ingredients together. Fold butter, milk and eggs into dry mixture. Add apricots and cream cheese. Consistency should be fairly stiff. Cook for 15 - 20 minutes. Makes 16 muffins. Place sugar, rind and coconut in bowl and crush together. Add flour, baking powder and soda together. Mix well. Melt butter and cool, then whisk in egg and milk. Pour liquid into dry ingredients and fold. Gently fold in blueberries. Spoon into greased muffin tin and sprinkle with sugar. Bake at 150°C for 15 minutes. Leave to cool in pan before removing. Soak the muesli in the orange juice and hot water for 10 - 15 minutes. Cream butter, honey and eggs, stir in the muesli mixture. Add dry ingredients and mix just enough to combine. Stir in the vanilla essence. Bake in a greased muffin tin for 20 minutes at 200°C. A small handful of raisins and chopped nuts can be added to these muffins if desired. Blend together butter, honey, egg, bananas and softened dates. Gently fold in dry ingredients until mixture is just combined. Spoon into greased muffin tins, top with pecan or walnuts and bake at 200°C for 20 minutes. Melt butter in a medium-sized pot or bowl. Remove from heat and add sugar, cocoa, eggs and vanilla essence and mix thoroughly. Sift in self-raising flour and add the finely chopped hazelnuts. Stir until evenly mixed. Place small spoonfuls on a cold, greased baking tray. Flatted a little with the back of a spoon. Bake at 180°C for 10 - 15 minutes. Beat sugar, eggs and oil together. Add beetroot. Into a second bowl sift all the dry ingredients together. Combine contents of both bowls. Pour the mixture into 2 greased 500 g loaf tins. Bake at 175°C for 40 minutes. Combine almonds and sugar. Stir in the cream - the mixture should be thick. Stir in the eggs, a little at a time, and finally fold in the flour. Add your own Easy Baking Recipes Here! We have lots of pages where you can contribute to throughout this website, as you can see from the links below. We love hearing from our readers, and hope you will be one of those we hear from too. Please share your favourite easy baking recipes here, so that other may enjoy eating them too! Just type in the form below, we will do the rest.